Ads have been two dimensional for a very long time. Whatever ad you see on TV, newspaper, print magazine, laptop screen or mobile phone screen – all are two-dimensional ads. The ad is on a screen and the screen has only two axis. X & Y. Width and height. One of the reasons why marketers never took the third dimension seriously was because there was no way to bring the third dimension in play. Before the age of digital marketing, TV and newspapers gave very limited scope for how their ad could reach the viewers. TV channels have 15 second and 30-second slots to run a video ad. There was no way to squeeze in more content and hence marketers tried to make the most of the 30 seconds. Ads involved showing something shocking, funny or anything that can get the attention of the viewer and make the viewer remember the brand. They had to achieve this under limited time. Newspapers gave marketers a very limited real estate. You have to fit in enough words in a specific dimension. You had to come up with a great title, an image which captures people’s attention and in the end make sure that the viewer recalls the brand for a future purchase decision, or at least does an action like cutting out a coupon or call a number. What marketers aim for are reach and frequency. If you are able to reach a lot of people but do not have the minimum required frequency to make sure that your potential customers remember your brand, then the ad is not going to serve its purpose. People could run an ad which is shown to five billion people, but only once. It wouldn’t serve any purpose. The best strategy with the technology available at that time was to repeat the same message across time, across locations, across channels. A fine balance of reach and frequency has to be achieved. Such kind of repetition is good for simple products and services. Consumer brands like electronics and food companies do not have complex products and there is nothing to educate the customer about. All the message they had to convey was: I’m a good brand, people love it, it’s good for you, so choose us over our competition. One thing that marketers were never able to crack using advertising was that they could never deliver their messages in a sequence, specific to each customer. Consumers did not have personal devices and all the media that was available like TV, Newspaper and Radio is not personalized and connected to a single consumer. In the age of digital marketing, we have the power to target specific customers with specific ads, but also retarget the customer with follow up messages which are unique for that specific segment of the customer. Such kind of power in marketing never existed before. And this power of targeting internet users allows marketers to do marketing in the third dimension. Digital marketing will lead to the death of frequency in ads. There is no need to repeat the same marketing message again and again to all the potential users, when you can deliver different messages, specific to a single user, over a period of time. By now you might be wondering what is marketing in the third dimension. The third dimension is time. For a specific internet user, you can deliver marketing messages over time. There are different ways to deliver marketing messages over time. The easiest way to do it is via Drip marketing. When you get people to sign up for your email list with lead magnet, you can deliver timed messages to your leads. 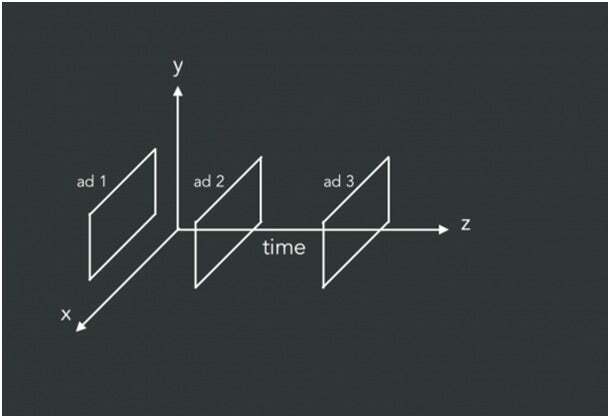 Another way to deliver marketing messages over time is via re-marketing and sequential advertising. When you can pixel your audience (meaning, tag them with a cookie), you know who your user is and what behaviour she performed. Based on the collected data, you can deliver personalized marketing messages to a single user. AIDA is a well-known acronym in sales. AIDA stands for Attention, Interest, Desire and Action. Without getting your prospect’s attention, you cannot generate interest in your product or service. Without interest, you cannot generate a desire. Without desire, no one is motivated to take action. You will not make a sale. Applying AIDA in marketing has always been challenging because of the lack of technology, until now. Digital marketing technology has evolved far enough for marketers to create AIDA affect using marketing, not just sales. Marketing is just sales at scale, and all the principles of sales apply to marketing as well. Until now, most marketers have shifted traditional advertising to digital advertising without thinking twice about the power of digital. Print ads in newspapers and magazines have become banner ads on websites. TV ads have become YouTube pre-roll ads. The internet and digital medium are being treated as a huge billboard. That’s one of the benefits of being a digital-first marketer. Digital marketers can see what traditional marketers cannot see. Digital marketers can see that marketing can be done in the third dimension. You can take the consumer on a journey of marketing messages which adheres to AIDA principle. For a moment, forget about digital marketing and think about how sales are made in the real world. The salesman never tries to sell something as soon as he meets the prospect. He first understands the exact needs of the customer and segments the customer. He then gives a sales pitch to the potential customer. The sales pitch is customized not just based on the demographics of the customer but also the exact needs of the customer. The salesman looks at how the customers need can be connected to the product’s offering. People do not buy anything immediately. There is friction in all of us to spend money because money is a limited resource. If everyone spent money impulsively, sales wouldn’t be so hard. Even if a customer needs a product, she is going to think twice before purchase. If a salesman is trying to close the deal, he is going to take it slow. The salesman would give it a few days after the first contact, remind the potential customer about the product. The salesman would explain all the features and benefits of the product over time. With time, people get convinced. If it is a product that they need, they will eventually buy. But there is a sales cycle. The sales cycle is shorter for commoditized and simple products. For complex products, the sales cycles are longer. In the B2C segment: food items, furniture, clothing, and appliances are simple products that might not need a long sales cycle to convince the customer to buy. Cars, Motorcycles, Homes, Laptops etc. are complex products which need a longer sales cycle. In the B2B segment, apart from commodities, most of the products and services are complex products that need a long sales cycle. With Digital Marketing, this sales cycle can be automated. The efficiency of one-on-one sales by a salesman can be achieved with digital marketing, at scale. When you time your marketing messages in sequence, you will be able to take your online prospect from awareness to interest, to desire and eventually to action, without human interference. People buy with emotions and emotions cannot be cultivated overnight. It takes time and that’s why timing your marketing messages to get the customer comfortable enough to buy is very important. Drip marketing is the easiest way to leverage the third dimension of marketing. Drip marketing messages are usually done via email, and sometimes via SMS and push notifications. Attention: The best way to get the attention of an internet user is to give them something of value, that doesn’t have a cost of replication for you. A free ebook with content on a specific subject or a problem is a lead magnet. You can promise to deliver a free ebook online in return for the internet user’s Email ID. Interest: You can deliver further value to the user using content via email follow up. As soon as the internet user gives you her email ID, give them what you promised. It could be a video, an ebook, a report, a tool or a free trial of a product. Set up email messages that can be delivered once in two days for the next 30 days. This will generate interest in your product. Desire: Intensify the desire for your product or service using customer testimonials, segmenting your subscribers and delivering more targeted messages, and by communicating the features and benefits of your product clearly. Action: Trigger action using scarcity. Tell your prospects that you have a limited quantity of the product and you are going to run out soon. Create a sense of urgency and scarcity to trigger an action – a buying activity. If you do not give a reason for your potential customer to transact within a specific period of time, the customer might postpone the decision indefinitely. Depending on the price and complexity of the product, you need to have a unique timeline. For education products, a period offour weekss is more than enough to polarize the customer as a buyer or not. Along with your drip marketing campaign, you can also run sequential ads which are based on time. Here, you do not have the contact details of your customer, but you can capture their browser cookies, which gives some level of targeting. When you have installed the Facebook Pixel and Google Analytics code on your blog, you will be able to set up sequential ads on the Facebook Ads and Google Ads Network. You can set up targeted messages for the first, second, third and fourth week. Sequential ads are not as effective as a drip marketing campaign, but it still leverages the third dimension of marketing. It is beyond the scope of this article to explain the mechanics of drip marketing and sequential advertising, but you can learn how to set up the ads with the help of online courses or consultants. It is important to learn the underlying principle behind these technologies to leverage them effectively. As a digital marketer, you need to re-think marketing from the ground up. If you try to build on the marketing methods from the traditional world, you will not realize the power of digital marketing. The power of digital marketing is your ability to leverage the third dimension, time, for marketing. Once you realize the power of setting up marketing messages through time, the third dimension, you will never go back to 2D advertising. It is very easy to convert prospects into customers when you deliver messages over time. The best part about leveraging the third dimension is that you end up building a strong relationship with your customers by communicating at the right time and right context.